What makes the HomeSource Design Center Unique? 172 Charlotte St., Asheville, NC 28801. If you’re using Google Maps or Apple Maps (Siri), be sure to NOT enter 172 South Charlotte St. That’ll take you many blocks from our location. We’re a few blocks north of I-240. Our contact page has a map. WHAT WILL I FIND AT THE DESIGN CENTER? 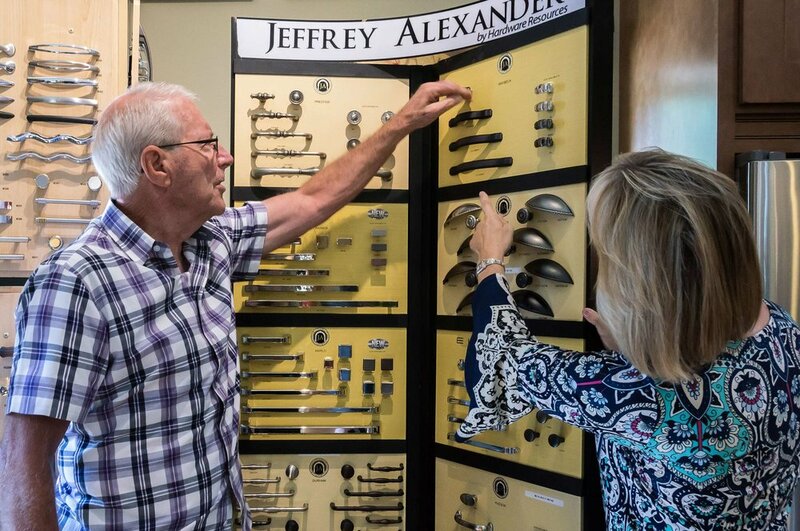 Advice, advice, advice - Unlike large, DIY stores, you’re not on your own with us, trying to make sense of a thousand different choices about dozens of different components for your home-building or remodeling project. They all have to function and look good together. Let us help you make sense of it all. It’s our job to meet you where you are, and help get you where you want to go. 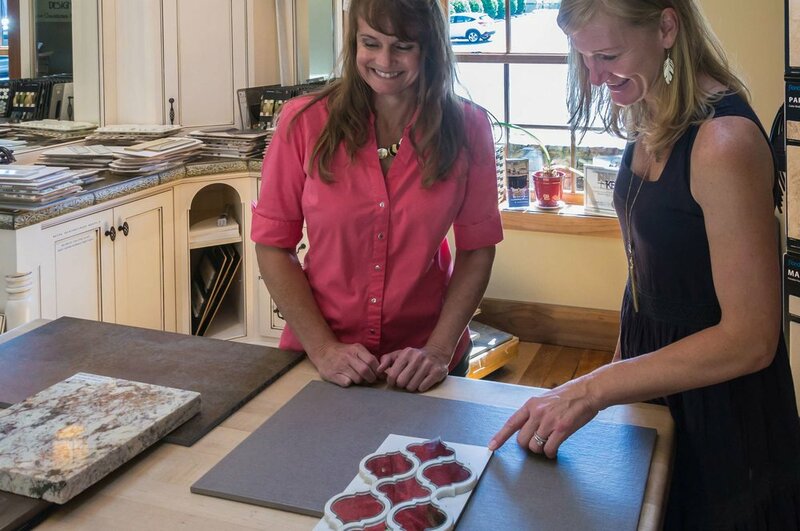 One-stop solution - where you can touch, feel, pick up, and gather together samples of all the parts and pieces for your remodeling project or new home, to see how they all work together, visually. How does a cabinet door look alongside the hardwood or tile flooring? Will the backsplash tile set off the countertop and cabinets? Not only can you consider all sorts of groupings for color and theme congruity, but our expert on-staff designers can offer suggestions. Kitchen and bath cabinets - Flip through dozens and dozens of door styles, wood species and tones, and cabinet construction levels. Lots and lots of special-purpose cabinets and other effort-saving goodies, too. Cabinet layout design service- Our on-staff designers listen to your needs, so they can design your kitchen or bathroom to work just right for you—all within your budget. Cabinet installation - We offer complete, expert cabinet installation—for both remodels and new construction. Cabinet hardware - Hundreds of samples of door-and-drawer pulls and knobs of every imaginable style and shape. A complete model kitchen - with all sorts of built-in appliances and cabinet features to inspire you. Tile - Racks and racks of floor, tub and shower, and backsplash samples from several manufacturers, including ceramic, porcelain, natural stone, glass, clay, and other materials. Countertops - including granite, quartz, soapstone, and laminate (such as Formica and Wilson Art), We can also have custom, stainless steel and concrete countertops fabricated in your choice of colors, textures, and designs. We can even incorporate the sink into concrete countertops, if you like. Sinks and faucets - Look over our samples of Blanco kitchen sinks and faucets. We’ll help make sure everything is compatible. Hardwood - Several species, grades, and color tones are installed on our floors to view. We’ll point out the pros and cons of engineered and site-finished hardwood—even laminate wood flooring. Flooring - Underfloor heating by Warmly Yours. No, not at all. Come in any time we’re open. Browse at your leisure, or Monday–Friday (or by appointment on Saturdays), have a free, initial chat with one of our on-staff designers. How much will I pay for all these services? If you really want some help with specific design layout ideas, your initial one-hour consultation is on us. After that, we’ll dive into the nitty-gritty of your needs, and design a complete kitchen or bathroom layout, using our latest CAD design systems. If you buy your cabinets from us, this design service is free. If you choose to go elsewhere, we’ll let you know, up front, what the charge will be for our design service. Do I have to bring you plans, or can you help me with that? We’ll meet you where you are—from doing a take-off on your finished plans to looking over a sketch you’ve done on the back of a napkin, to just ideas you’re kicking around in your mind. That’s the beauty of working with HomeSource Design Center. What brand names does HomeSource Design Center offer? Can you help me if I’m already working with another builder or remodeler? Absolutely! We coordinate with customers of dozens of quality contractors to make selections, arrange installations—whatever you and your contractor need from us. Do you do remodeling projects? We sure do! Interior and exterior. If you’re not already working with another contractor, we’re ready to be your turnkey remodeling service. Over the past 20-plus years, here in Asheville, we’ve completed hundreds of remodeling projects for satisfied folks all around the area. Here are some examples. I’m torn between remodeling and starting from scratch with a new home, but just don’t know which way to go. Can you help me figure it out? Of course. Since our sister company, HomeSource Builders is both a custom-home and remodeling contractor, we can lay out all the pros and cons of new construction and remodeling. If this is your focus, we’ll have you chat with a representative from HomeSource Builders, who has built and remodeled countless homes in the Asheville area for the past twenty-plus years. Have a look at their website for more details and ideas. Have a different question? Contact us to learn more!